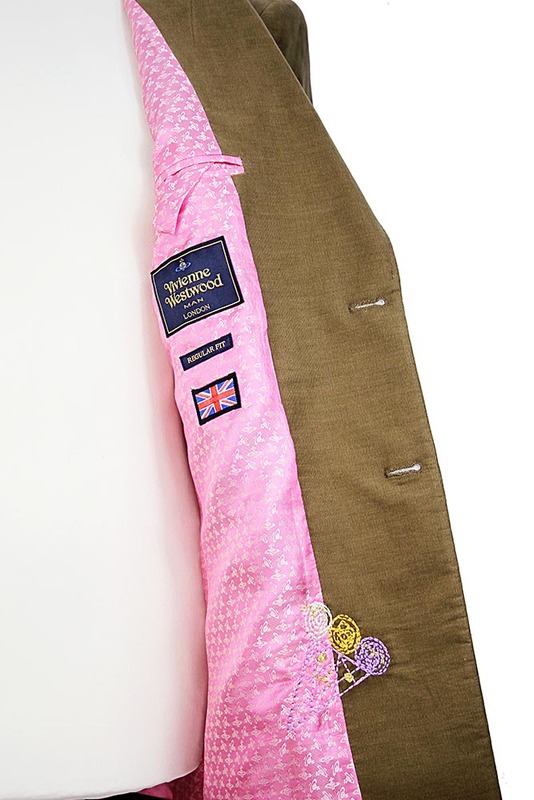 Vivienne Westwood Man London Baby Cord Gable Jacket in tan colour. 100% cotton with viscose and acetate lining. 2 button fastening. 2 pockets with flaps and angled left chest pocket. Long lapels. 4 button cuffs with 3 working buttons and one that can't be fastened. Single vent at rear. Fully lined inside in pink orb fabric. Single pocket inside with button fastening. Regular fit. Embroidered at bottom of left inside front panel. Beautiful piece that matches the waistcoat in the same fabric and trousers not yet delivered to make an awesome suit.